Hershey's Chocolate World is located in downtown Hershey, Pennsylvania. It's within walking distance of Hersheypark, ZooAmerica and other Hershey area attractions. Chocolate World is open year-round (hours depend on the season) and offers FREE admission to visitors. You'll find free parking on-site if you plan on staying less than 3 hours during your visit. If you're planning to stay longer, you'll have to pay a parking fee. 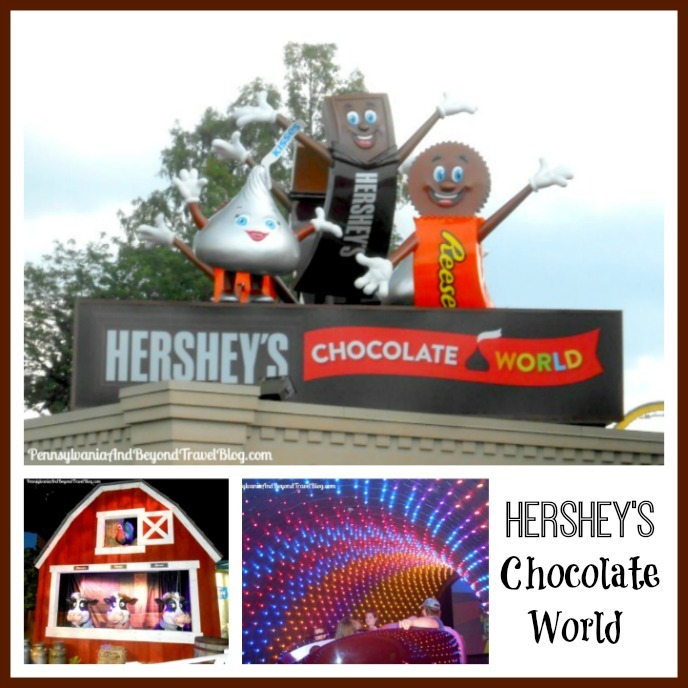 You'll find various attractions at Hershey's Chocolate World for you and the family to enjoy. There's the Chocolate Tasting Experience, the Tour Ride, Create Your Own Candy Bar, 4D Chocolate Mystery, Hershey's Photo Studio, gift shopping, the food court, etc. If you want to take a guided tour around Hershey, you'll find Hershey Trolley Works located here too! On the day that we visited, they were extremely crowded and I mean CROWDED! We had to wait over 30 minutes to even get a handicap parking spot. Once in the doors...it was even worse! I'm not sure what was going on...but as you came through the main doors hundreds of people were just standing around and you could barely walk through that area. I wish the staff & security would of moved this people forward or to the side, instead of letting them block the entrance like that. Once we made our way through the crowds we headed to the Tour Ride first. As I stated, it was extremely crowded that day, so we had about a 30 minute total wait before we got on the ride. The staff will help you sit in one of the ride cars which holds 5-6 people. We had 5 (3 adults and 2 children) in our party, so they left us all sit together in one car. The tour ride lasts approximately 10-15 minutes in duration. During the tour you'll learn where Hershey's gets their cocoa beans, how those beans are manufactured, how chocolate is made, how it's molded, packaged, etc. My 2 grandchildren thought the best part of the tour was the singing cows at the beginning of the tour and they loved it when our ride car passed through a multi-light tunnel. After your done with the ride tour, you'll climb the steps and head out of this section. As you're walking through the area, they'll offer you the opportunity to purchase a photograph of you during the tour and right before you exit this area...you'll be given a free Hershey's miniature chocolate bar. We opted out of the photograph as we found them to be too expensive. Just our 2 cents on that. We then headed down to the gift shop area and did a little shopping. I love to buy our Hershey's candy when we're there as it's so much FRESHER than the stuff you find on your supermarket shelves. Trust me, you can tell the difference when you eat it! With that said, you do pay a little bit more for it, since they don't accept coupons and run the candy on sale like the grocery store does. However, I appreciate the freshness & variety of candy products that I can get there, so I always stock up during our visits. The grandchildren wanted Hershey's Chocolate Milkshakes, so we headed into the Food Court to get them. Again, due to the crowds, it took us 15 minutes to get them and then we couldn't find any where to sit down. Seriously, we walked all over the place for about 20 minutes hoping to find a place to sit down and found no empty spots. People were sitting for LONG periods of time and we're even eating at all. I think they should limit that during the busy season....in other words, if guests aren't dining, they shouldn't be allowed to sit at the food court tables! We decided to cut our visit short that day due to the massive crowds. It's hard to enjoy yourselves when you have to wait in extremely long lines, can't find a place to sit and eat and the lines going into the restroom were ridiculous. They definitely need better crowd management down there. If you plan on visiting Hershey's Chocolate World in Hershey Pennsylvania, I recommend that you go in late September through early May to avoid the crowds. If you go during the busy summer tourist season, expect crowds and long lines. Overall, we had a nice time with the kids. We're going to plan another trip in late Fall, once all of the crowds are gone.